I wish people threw tea parties these days. 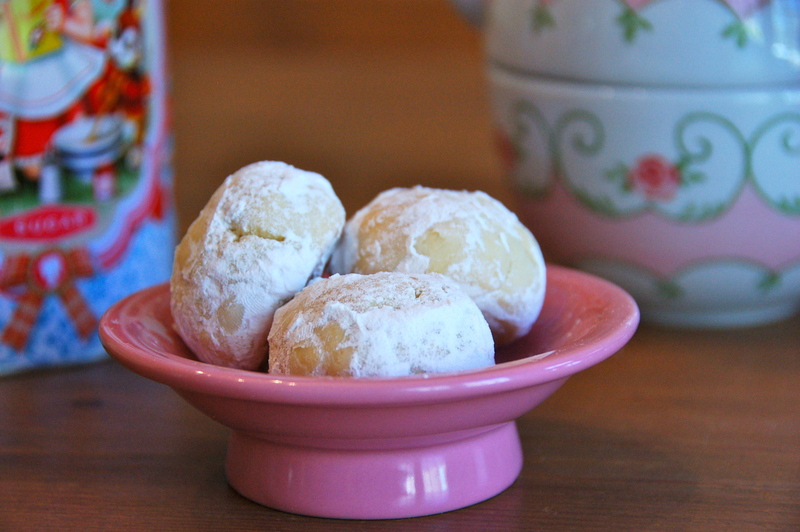 Lemon Powdered Sugar Tea Cookies! Personally, I’m a pretty big lemon fan. Out of all of the fruits that are used in baking, I have to say lemon is my favorite. Lemon squares, lemon cupcakes… I love them all. These cookies have a shortbread-like consistency; they’re on the dry side (perfect for dipping in tea!) and have a light and refreshing lemon flavor. Sometimes, lemon flavored desserts have a way of turning out too tart because bakers think the only way to achieve the flavor is through lemon juice. That’s not true! What makes this recipe so great is the use of fresh lemon zest in the dough in addition to freshly squeezed lemon juice. The zest adds a pop of flavor without making the cookies overly lemony. What’s so special about these cookies is their powdered sugar coating. After baking, by rolling the warm cookies in a bowl of powdered sugar, it enhances the lemon flavor and makes each cookie look like a darling little snowball. So, bakers, roll away! 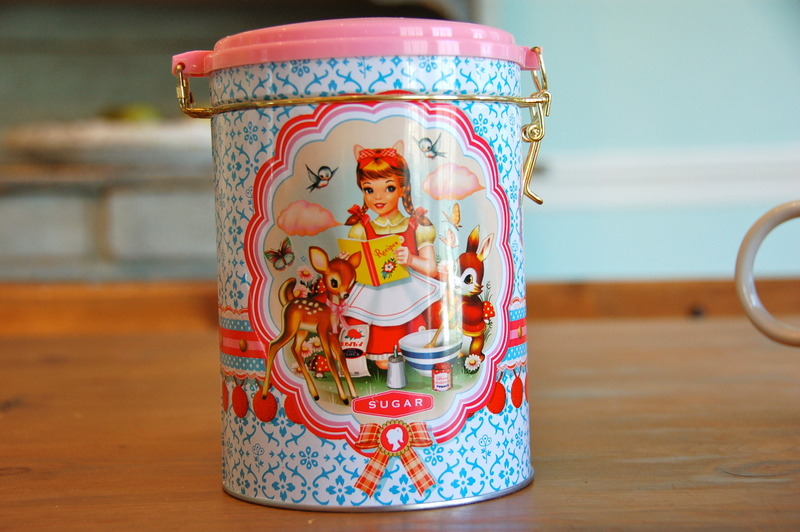 Finally, I wanted to share with you the precious new powdered sugar canister I just got from ModCloth. If you don’t know, ModCloth is an online store that sells vintage-style clothing (dresses especially!) and an assortment of home goods like this. I absolutely love the store and when I saw this container, I fell even more in love with the sweet little spring scene on the front! Anyway, the colors are so bright and happy, and I had to include a picture in this post – it belongs at a tea party! and to invite me to your next tea party! Preheat the oven to 350*F and line two baking sheets with parchment paper or silicone mats. Whisk the flour, baking powder, and salt together in a small bowl and set aside. In the bowl of a stand mixer, cream butter and 1 cup of sugar until the mixture is fluffy and light (about 3 minutes). On a low speed setting, add the egg yolk, lemon juice, lemon zest, and vanilla into the mixing bowl and beat until incorporated. Roll the dough into 1 inch large balls and place them slightly apart on the baking sheets. Bake the cookies for 20 minutes, or until very lightly golden brown. They may appear slightly undercooked, but that’s how they should look! Remove the cookies from the oven and allow them to cool slightly on the pans. After about ten minutes of cooling, roll the cookies in powdered sugar, coating the whole outside of each one. If the powdered sugar won’t stick, roll the cookies on a damp paper towel first, and then dunk them in the powdered sugar. Place them back on the pans or on a rack to cool completely. They’ll store in an airtight container for up to two weeks! Enjoy! I’m so glad you like the recipe, Rebecca, and that you’re a fellow tea party enthusiast! Let me know how they turn out!